This class is sponsored by Auckland Zinefest 2015. For more information visit http://www.aucklandzinefest.org/events/. ALL SPONSORED TICKETS HAVE NOW BEEN SNAPPED UP! This workshop is a unique intro to the magical, creative world of mail art. Create your own projects and get amazing things in the post! Mail Art 101 will provide with a bit of history, a lot of hands-on fun and a tonne of inspiration to get you going on your own. 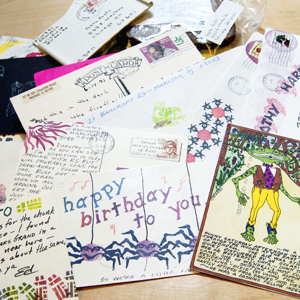 Our pals at Wikipedia sum up Mail art as a worldwide cultural movement that began in the early 1960s and involves sending visual art (but also music, sound art, poetry) through the international postal system. The Mail Art 101 workshop will provide with a bit of history, a lot of hands-on fun and a tonne of inspiration to get you going on your own. Instructor Erin Fae’s mail art work appears in the book Good Mail Day and has been part of numerous mail art exhibitions. We’ll supply some materials, but bring anything that you’d like to work into your mail art masterpiece! Just remember it’s gotta fit in the post! Erin Fae is an artist, activist and mischief maker who divides her time between Auckland and New York City. She creates prints, books, zines, mail art, sketches, and photographs for sale, chance, and exhibition. For three years, she ran Alphabet City, a community art space in Eden Terrace devoted to the printed and written word. 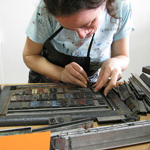 Devoted to community engagement and public art access, Erin also teaches print, zine and book related workshops. She wants to share the magic of printmaking, mail art and letterpress with as many people as possible. The featured image is borrowed and edited, with thanks, from Flaxman Library under a Creative Commons licence.